Vice president Joseph Biden has taken his ‘Middle Class Task Force’ on the road planning to canvas the country for effective ways and means to spur ‘green’ job growth, reduce greenhouse gas emissions and address the historically large and still growing income disparity evident across American society. Biden and team made their first stop in Philadelphia yesterday. Convening an inaugural meeting in the vice president’s home state, the invitation-only conference included Energy Secretary Steven Chu, Governor Edward Rendell, senators, representatives, clean technology and renewable energy experts, local community and business leaders and mayors from around the US, all of whom are vying to claim the title of ‘America’s greenest’ for their cities,’ according to this news report by Philadelphia Inquirer reporter Thomas Fitzgerald. “We’re making an unprecedented investment in . . . clean energy that will be able to create tens of thousands, over time, of good, high-paying jobs, the vast majority of which are not exportable,” Biden was quoted as saying. Philadelphia Mayor Michael Nutter’s presentation prompted representatives from Los Angeles and Portland to emphasize their own efforts to lead by example when it comes to finding ways for US to make a growth-oriented, equitable and cost-effective transition to a low carbon society built upon a cleaner, more diversified fuel and power base, the ability to reduce greenhouse gas emissions, improve energy efficiency and conservation, and reduce waste. “Philadelphia was the first capital of the United States, and we plan to be the first capital of green jobs,” Mayor Nutter was quoted as saying. Even implementing a costly national emissions cap-and-trade system will yield dividends down the line in terms of stimulating employment and addressing income disparities, as well as avoiding the worst threats and costs of climate change and ongoing environmental degradation, president of the Environmental Defense Fund Fred Krupp told attendees. “A wind turbine contains 8,000 parts, and a mid-sized wind farm with 44 turbines uses 6,500 tons of steel…These green jobs aren’t just exotic jobs in Silicon Valley. They’re everyday jobs,” Krupp was quoted as saying. He argued that even emissions caps had the potential to create hundreds of thousands of well-paying jobs. 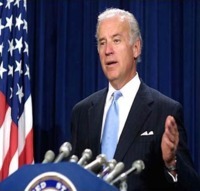 Biden emphasized the Task Force’s intent to shore up sagging middle income incomes and wealth. He pointed that even with the economy growing, productivity, real estate and stock market prices increasing, middle class incomes fell an average $2,000 from 2000 to 2007. “We broke the bargain, the bargain that was made back in the middle of the last century – that workers producing a more productive economy would participate in the benefits,” Biden said. “We want to make sure that does not happen again,” Biden was quoted as saying.